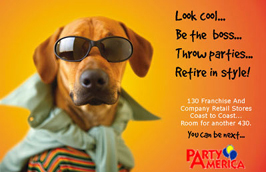 If you are looking for information on the Party America franchise business opportunity, Party America franchises or Party America franchising, then you have come to the right place. Party America celebrates record profits! Party America took top honor as the Party Retailer Of The Year 2004 at the National Party Retailing Awards held in Chicago March 14, 2004, beating all of our competition. We also took the top honor for Most Innovative Balloon Merchandising Award!